The performer shows a paper bag to be completely empty. All the sides of the bag are displayed fairly and the audience is convinced that there could not be anything hidden in it. Yet six solid dice are produced from it! If the performer wished, he may show the bag empty at any time during the productions. 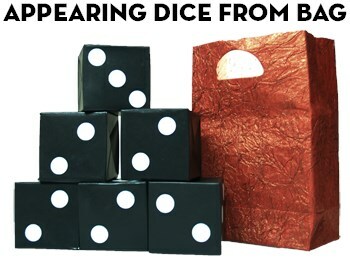 The performer ends up clean with six solid dice on his table and an empty bag. The stack of dice is much bigger that the bag and it is impossible to put them back in it.